The social, economic and spiritual lives of Mende men and women in Sierra Leone are governed by a number of secret initiation societies of which the primary societies are the male Poro (meaning 'no end' or 'far behind') and the female Sande (also called Bundu or Bondo among the Temne). Mende boys and girls must pass through their respective initiation societies to be considered rounded adults with full insight into community teachings, traditions and expected behaviours. The main aim of the Sande is to prepare girls for marriage and motherhood. Annual, six months long celebrations are held during the dry season to publicly welcome the initiates back into the community as adults. The initiates are led through the town by a masquerade called ndoli jowei (meaning 'the Sowei who dances' among the Mende or a-Nowo among the Temne), believed to be the physical embodiment of Ngafa (also referred to as Sowo, Nowo or Sowei in other sources), the guardian spirit of Sande. 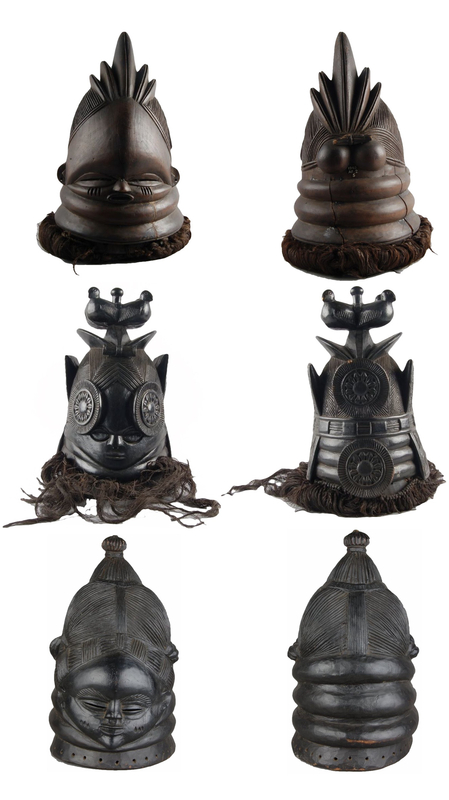 The ndoli jowei helmet mask is owned by a Sowei, the senior official of the Sande). NOTE: The Vai, Sherbro, Temne, Krim and Gola possess similar Sowei masking traditions. For more, see the article on Women's Art and Initiation in Mendeland on the Art & Life in Africa website, hosted by the University of Iowa Museum of Art (UIMA) HERE.